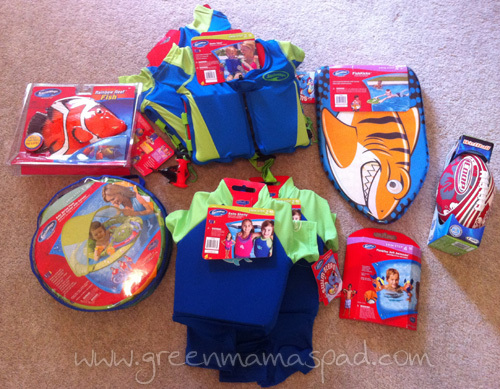 Are you ready to pull on your bathing suit and get into the water with your kids this summer? Well I am not - my body certainly is NOT in bathing suit form. This is one of the reasons why I started the 20 Second Fitness Program recently. I need to get in better shape so I don't frighten myself and others when I hit the beaches later this summer. We have got a lot of swimming planned for and I want to feel comfortable out there. On the other hand, my boys are all ready to get their swim on! We have 2 weeks left of school and then on June 27, three of them will be starting swim lessons at our local lake. The little guy is too young for this swim program but we plan on having lots of fun splashing in the water as well. Last week I received a huge package from the SwimWays Swim Steps line with lots of goodies to help with swim training this summer. The SwimWays Swim Steps product line has a variety of swim training products over four different levels of swimming skill to help your child learn how to swim. Swim Step 4 = I Can Do it! 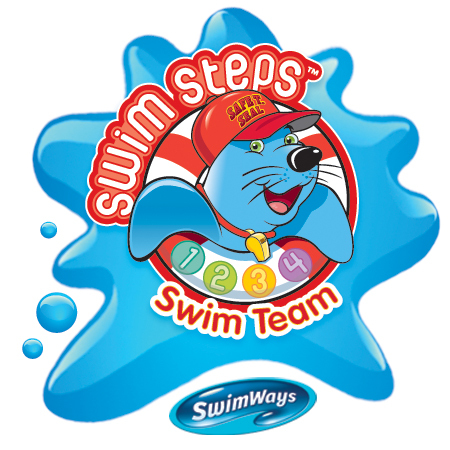 Our Swim Steps program is specially designed and proven to help kids gradually gain confidence in the water. By making swimming exciting, safe and rewarding, SwimWays points the way toward a lifetime of splish-splashing fun! For our six year old, he has had two Springs and Summers of swim lessons in the past at his old preschool. So this will be his third year of lessons, but first at the lake. I felt that he was at the Swim Steps Level 4 and so he will get to try out the kickboard and swimmies. For the twins (four years old) I thought that Level 2 was a good place for them to start with the Swim Vest and Swim Shorty. This will be their first experience with swim lessons and I am excited to see how they do! Of course we will start the little guy off at Level 1. Not only will we be spending lots of time at the lake, but I also plan on doing some pool hopping. We do not own a pool but we have three family members that do which means three pools we can play in this summer. Hopefully our family doesn't mind us stopping by. As a Swim Team Ambassador you will find several posts throughout the summer about how my boys are using and enjoying their SwimWays gear. So be sure to stop back and follow us on our swimming journey!